I lost my “To Do” list the other day. For some reason I decided to type my list on the computer but I had not saved it. I was rushing to my volleyball match and somehow lost the list. That never happens when I write my list on paper. One other time I wrote my list on the computer. I discovered that I do not gain the same satisfaction deleting items from the list as I do when I physically cross the item off my list. I have even gone so far as to buy “special” notebooks for making lists. I started using small notebooks for lists when a colleague pointed out that I had 3 sheets of paper, all with different lists. Why, he asked, didn’t I put them in a notebook so I could keep better track of the lists. Ever since, I’ve carried a small notebook, which often doubles for taking notes at informal meetings. One of my favorite notebooks only allows me to list two items and has pithy comments, such as “Today’s about quality not quantity” and “Today I will get some stuff done”. For me, only listing two items is nothing short of a miracle. Yet when I do this I can happily report that I always complete the assignments. And after all, isn’t that the point of a list? Early in Sarah Lane’s career she thought she would be a mathematician since she was good at math. But the co-host of iPad Today, the Social Hour and Tech News Today at TRiT.tv, discovered she liked a few other things, too. “I like being social. I like talking,” she told an audience at a recent social media workshop in Idaho Falls, ID. As a result she studied broadcasting at San Francisco State. As an intern she worked on a documentary about San Francisco in the 1980s. At the time there was no social component of the internet, Sarah said. Her research was conducted in a basement reviewing tapes. She would go on to work for TechTV on a show called “The Screen Savers” for which she produced the “Blog Report.” Showing the audience one of her early reports, she noted how frightened she looked. “I was frightened that I would say something just a little wrong and the audience would pounce on me,” Sarah said. Earlier in the week, a robin repeatedly flew at my office window. Bang. I’d turn around to look and he would be stunned on the ground but otherwise okay. Several minutes later, “bang”! Finally, after a few hours of this, the robin grew wise and realized he was not getting into my office. He flew away and, I hope is doing well wherever he landed. Upon this epiphany I picked up the phone and spoke with my business coach. We discussed several items, and helped get me back on track. I knew what I needed to do; I simply needed to talk it out loud. So if you don’t have a coach, find a friend or colleague and talk it through. Follow 18 Minutes, a great time management tool. Bring healthy snacks to work. Eating junk food does nothing for my concentration so if I have an apple or carrots handy, I’m better able to fuel myself. Plus, the “crunch” just sounds good. Set aside specific time to work on emails. I’m not alone in finding an inbox that remains perpetually filled. Many emails I can glance at and quickly delete. Others require more thoughtful responses. Identifying time each day to answer emails or forward them prevents them from going into a black hole. Schedule time for friends, family and fitness. By adding it to my calendar, I have something to look forward to and I create appropriate work/life balance. Once I stopped hitting my head into my virtual wall, I quickly discovered how much more energized and engaged I became. The robin was a good reminder. I just hope he didn’t end up with a headache while trying to get me to pay attention! Today is National Columnists Day, which recognizes the importance and value of newspaper columnists. It was established in memory of the day columnist and Pulitzer Prize winner Ernie Pyle was killed in World War II. I grew up reading Dave Barry (just going to his website makes me laugh out loud), the late Erma Bombeck and Bob Greene (whose career had a tragic twist). The columns were funny, moving, candid, and I could never get enough of them. At one point in my newspaper career, I was given the opportunity to have my own column, which I called “Off the Cuff,” a recommendation from my father. It allowed me to write on most any topic. I enjoyed that freedom. In later years, I was drawn to the columnists at the Richmond Times-Dispatch. My friend Julie Campbell reminded me of those great writers, who included Steve Clark, Betty Booker and Jann Malone. When I was at the Roanoke Times & World-News I enjoyed reading Ben Beagle. In researching this column, I found The World I Never Made, which is a collection of his columns. Why not make time today to read your favorite columnist? And while you’re at it, add a comment to this blog letting us know who you are reading. Teddy bears would become a key character in a series of mysteries he would write. 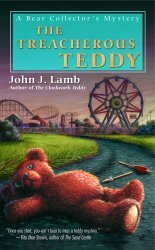 Lamb is the author of the “Bear Collector” mystery series. He also is a retired cop with 22 years of service with a Southern California police department. During his career he served as a patrol officer, hostage negotiator, homicide investigator and patrol sergeant. The first gift he gave his future wife, naturally, was a teddy bear. The two started collecting handmade bears. “They are original, and they’re amazing,” Lamb said. After retiring to the Shenandoah Valley in Virginia, Lamb’s publisher told him they were looking for a new line of cozies – mysteries in which there is no blood and no guts. Lamb realized, “I’m living a cozy” as he sat on his front porch and thought about the hundreds of teddy bears he and his wife had collected and their comfortable home with six cats and two golden retrievers. He wrote the first few chapters of the first book, The Mournful Teddy, and within 24 hours had a three-book deal. He would go on to write four more books in the series, all with the word “teddy” in the title. “You have to have a word you can hang your series on,” Lamb said. How do you read? Perhaps, I should be asking whether you still read. It’s an interesting question and one I wanted to pose given that this week is National Library Week. One of my favorite authors, Ellen Crosby, posted a survey on her Facebook page asking people how they read. The choices were – they buy the book, they read on an e-reader or they go to the library. The winner was real books that are owned, followed by library books. Of course, this was a small survey and is not scientific, but I started thinking about how I consume books. I’ve moved a lot in my adult years so I’ve always tried to keep my collection of books manageable. Despite that, if I moved today I would easily fill 15 to 20 boxes with books – and those are only my favorites that I’ve kept. And then there are all the business and leadership books that I have at work. To cut down on books, though, I’ve become a huge fan of my library. I can walk to it and pick up a few books. I also volunteer with the Friends group of my library. We hold two books sales each year. This is great because I can buy books, read them and then contribute to the sale. I also coordinate our Writer Wednesday series where authors come in and speak about their books. Topics have included mysteries, remodeling, history and anything else that will interest our patrons. The wonderful part is that the topic almost doesn’t matter because readers love to meet authors. I also have succumbed to the e-reader. Last fall I traveled to Indonesia, which is a 30+-hour journey. I needed some variety in my reading choices and not much weight in the suitcase. So I bought a Nook. I love it for traveling and enjoy reading on it. I have some friends who even have abandoned a physical book for their e-readers. Apparently, we’re not alone. A Pew Research Center survey showed that one in five American adults read an electronic book in the last year. For me, though, at the end of the day, I still want to hold a book, preferably new, so I can sniff the ink on the page and hear the sound of the pages crinkling and the spine slightly cracking as I open it to explore. 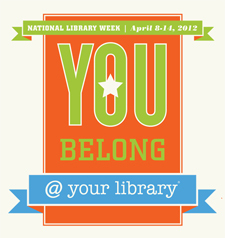 Would you take the time to share how you consume books by posting a comment this week as part of National Library Week? NFPW member Jill Miller is known for great ideas and providing businesses with what they need to thrive. Jill Milller organized a Cash Mob in Wichita, KS. She took that to the next level when she organized Wichita’s participation in international cash mob day. Cash Mobs are similar to Flash Mobs, but instead of dancing people go to predetermined businesses on a specific day and spend a little money to help support locally owned businesses. At midnight she started a Facebook group and within 36 hours, more than 1,500 people were ready to go shopping at stores that were selected because they had been open less than one year, sell products for men and women, give back to the community and agreed to be mobbed. Jill was tired of seeing local businesses “that were awesome” go out of business. After talking with a client about it, she was more encouraged to spearhead the effort. “I just had to go for it and do it,” she said. She leveraged her social media network. “That really helped me pull it off,” Jill said. That’s a good thing because Jill already is planning the next Cash Mob for April 21.